Make your dad feel extra-special this year with a homemade gift to celebrate Father's Day! These unique ideas range from kid-made cards to DIYs fit for any dad–from grill masters or wannabe mixologists. Pick your favorite and start crafting in time for the holiday! Celebrate your dad this Father's Day by baking a batch of cupcakes and decorating each one with a handmade "dad glasses" cupcake topper, complete with tissue paper lenses. Molly, a graphic artist, and blogger at Almost Makes Perfect provides a printable template for modern Father's Day gift tags. Available in black, gray, and green, these tags dress up any package for your husband, father, or grandfather. Homemade orange bitters make the perfect gift for any backyard mixologist. This Father's Day gift keeps dad's bar cart stocked, so he can whip up a Manhattan or an Old Fashioned on the fly. Allison at Dream a Little Bigger shows us how to transform a small wooden storage crate into a tool bin for Dad. Customize it with stained wooden letters that spell the word "Dad," and then fill the crate with jars to help him organize his handheld tools, nails, and screws. Make your dad or grandpa a modern photo stand using affordable and easy-to-work-with balsa wood. Once the frame is complete, stage it with several family Polaroids for a gift he's sure to cherish. Does your dad have a sweet tooth? If so, bake him some delicious cookies and package them in a quick and easy handmade gift bag that showcases your homemade sweets. Tell Love and Party shows us how. Impress any modern or stylish dad with this personalized woodgrain flask from Almost Makes Perfect. Woodgrained contact paper and a paint pen are all you need to add a personalized element to this Father's Day gift. Waking up in the morning for work can be tough for dad. But this delicious-smelling soap combines two of his favorite scents—coffee and stout beer—making his mornings much more pleasant. This sweet and spicy snack mix from Sarah Hearts is housed in a reusable canning jar and decorated with printable labels and gift tags. This personalized treat makes a perfect gift for fathers who like to snack while watching their favorite Netflix series. Surprise your husband this Father's Day by making cute t-shirts for your kids that say: "My Dad is Super Rad." Just trace the provided template onto transfer paper and iron it onto a plain t-shirt or onesie. The Homemade Banana gets crafty with this stylish gift idea for dad. Just break out your anvil (if you have one) for this super quick craft—a leather keychain with painted metallic detailing. Help keep dad organized by giving him plenty of room to store his growing tie collection. This DIY rustic tie rack by Craftaholics Anonymous can be whipped up in an hour and made to look like an authentic antique if you use the right stain. Grab a few squares of slate at your local tile shop to make these masculine drink coasters. A copper-colored Sharpie and stencil add personalized detailing. Then, tie them together with inexpensive twine and package them up with copper drinking mugs. House dad's toiletries in this seamstress-made dop kit from The Crafty Gentleman. With this Father's Day gift, dad will pack a reminder of you with him when he travels for work. Hosting a Father's Day party? This easy decor idea from Elli customizes the theme with Father's Day drink and snack labels. Just print them out on craft-weight or label paper and wrap them around bottled beverages and snack containers. Help dad keep his electronic cables organized with these leather cord organizers from Delia Creates. He can say "goodbye" to tangled headset and charger cords with this useful gift. Finding the perfect card for dad can be tricky. So why not make one instead, Minted Strawberry's printable designs offer you a way forego the card aisle and make a handmade and heartwarming note yourself. Make your dad a minimalist wallet this Father's Day as a replacement to his old worn out one. This thoughtful handmade gift only requires a few scraps of leather, scissors, and a sewing machine to get the job done. Does your father love to BBQ? 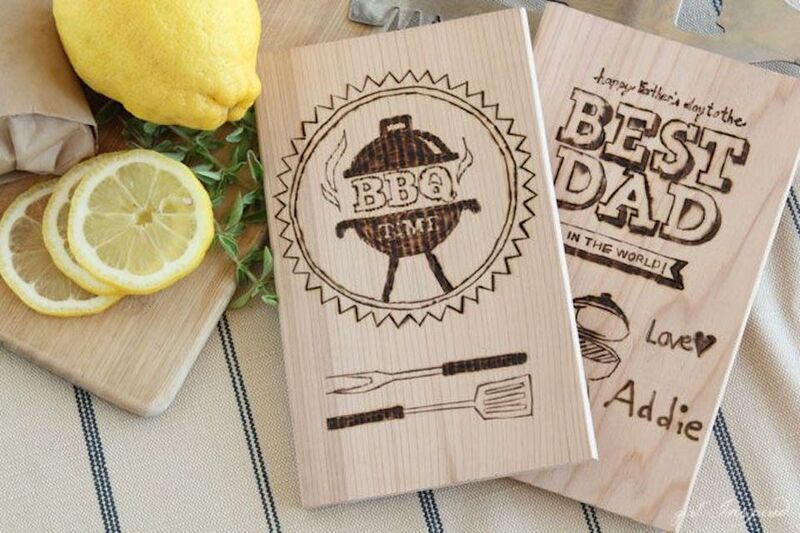 If so, make him custom wooden=grilling planks with father-themed designs. This craft requires the use of a Versa-Tool, which can be purchased at most craft stores, and is not recommended for use by young children. Avid seamstresses can make dad look fashionable with this handmade bow tie. To make a bow tie, you'll need 1/4 yard of fabric, 1/4 yard of interfacing, and matching thread. He may even love his bow tie so much that he asks for another one, come Christmas time. Elementary-aged kids might find it difficult to think up the perfect gift for their father. So help them make their own coupon book instead. The printable coupons from Make Life Lovely offer blank spaces for children to offer things like a free hug or one-time lawn mow. Young children can easily make a heartwarming gift for their father or grandfather out of this printable handmade book by Eighteen25. The printable templates offer a way for children to fill in personalized information and messages for Dad or Grandpa. Create a bright and bold pop art-inspired painting for your father to hang in his office. Trace tools like scissors, screwdrivers, and pliers for a basic design that can be painted with flat colors in acrylic paint. Use a Shrinky Dink kit and a photo of your child to create a customized tie pin for dad to wear to work. This creative DIY project can also be used to make key chains that house a photo of each child on its ring. Spoil your dad by making him stylish custom cufflinks with instructions from Creme de la Craft. Choose buttons that match Dad's style so he can wear them either to work or out on the town. Does your dad enjoy sipping a glass of whiskey to unwind after a long day of work? Then create glass tumblers that mimic the expensive etched ones sold in specialty stores. He'll be surprised you mad them yourself. Help your dad smell great, while also keeping his skin healthy, soft, and blemish-free with this moisturizing shave cream. Rosemary and mint provide a masculine pick-me-up to his morning shave routine. Doesn't your dad love bacon? If so, Snixy Kitchen's recipes for bacon salt, bacon jam, and bacon candy makes the perfect gift set for any bacon-obsessed foodie. This soft flannel throw is so easy to make that you may want to bang one out for every member of your family. Try out It's Always Autumn's instructions on dad, first, as a cozy accessory for television night. This engraved wooden mousepad makes the perfect gift for any dad who works in an office. Just cut out a wooden circle, create your message with a wood-burning tool, add stain, and you're done.